I am not an all-you-can-eat type of person, but the rest of my family is. Any time we go to ChuckARama, I go straight to the Kettle Roasted Turkey. And I go again. Then get a third helping for dessert. I don't know what they put in that stuff, but it is good....oh, so good. I love simple, uncomplicated foods. When I first had their turkey stew, I thought I was eating beef. Then I thought, maybe it's pork. No, it's gotta be something else, I told myself. I finally got the courage to ask someone working there and they told me it was turkey. More importantly, turkey thighs. Now, when Thanksgiving rolls around, I'm all about the white meat. I don't touch the drumsticks, wings or thighs. That's why I cooked two turkey breasts this year. 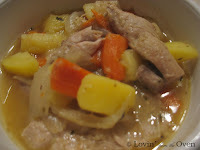 I looked all over the Internet for a recipe and finally stumbled on Dad's Turkey Stew. Of course, I made a few modifications; but this is close enough to the real deal. Update: If you can't find turkey thighs at your local grocery store, ask the butcher. In Harmon's grocery, they use turkey thighs to grind them into their sausage. Preheat oven to 300 degrees. Heat olive oil on medium high heat in dutch oven on stove top. Wash and pat dry turkey pieces. Brown turkey pieces, skin side down, 2-3 minutes on each side. Remove turkey pieces, add onion and celery. Cook until softened. Add salt and 1/2 of the stock. Bring to a simmer; remove from the stove and put in the oven, covered, for one hour. After one hour, remove from oven and add the rest of the vegetables, herbs and rest of stock. Return to the oven, covered, and cook until tender, for another hour or more. As you recall, the meat had such a unique flavor you couldn't tell if it was beef or pork or turkey. This unique taste indicates that they may have marinated the turkey with some special sauce or flavor. Which I think it key to the taste of this dish. Unfortunately, I have no idea what they do to the turkey thighs. I tried bribing a waitress once, but they still refused. Thanks again for the recipe, I totally enjoyed is still. Norm, if you can figure out the 'secret,' let me know! I will try marinating the turkey thighs to see if it helps...thanks for the feedback! Hey Frieda, I was never able to duplicate the exact recipe. However, I found an alternative at Costco. Its called Jennie-O Turkey Pot Roast. I baked my in the oven and covered 3/4 of the pan with tin foil to keep moisture inside the turkey. I think the missing ingredient could be coke or some other soda pop. There was a story in the paper about Chuck-a-rama, and they told how the owner first made this dish at a scout camp. I know for a fact that there is not much gourmet cooking that goes on at scout camp, so I figured it must be something that they'd have on hand anyway. Also, I've heard that Costa Vida and Cafe Rio make their sweet pulled pork with coke, and it kind of reminds me of that. I thought I was the only one who had the kettle roasted turkey for dessert! Thank you so much for sharing this! Same boat here, not a big fan of C-O-R but if I have to go that is all I eat... love that stuff. Today I tried it, marinading the meat a day ahead. The marinade I tested was one cup of coke, a cup of orange juice, some worcestershire, and some spices. I cooked it bone in then cut it up into pieces after it cooked. Overall I think it tasted great and pretty darn close to C-O-R but still not quite there. The meat a C-O-R was a lot darker in color. It must be something else in the marinade. Also next time I try it I will cut up the meat first before marinading but still keep the remaining bones/parts simmering in the pot. I used Watkins meat marinade, and the flavor of the turkey was very similar to C-O-R and quite brown. I also have use Teriyaki Marinade, and that was good also, but not the same. Then I tried marinade made of two beef bullion cubes and also cooked the turkey in the marinade. Bingo, this produced the flavor I wanted. The turkey I used was a frozen boned turkey and it tasted very close to the turkey in C-O-R. So I suggest using Beef bullion cubes and cooking the turkey in them then cutting it up and putting in with the vegetables after they are cooked. This is what worked for me. Yay!!! Thank you so much for sharing your variation. I'll have to try it again very soon!